An Eternal optimist, always sporting a smile; must have’s… intense workouts; preferably the gym, CrossFit or running, reading, writing, and enjoying great times with family and close friends. Wife of 29 years and mother of two children. As a friend and former employer would always say, “I am CEO of Tanya Inc.” No, I don’t own a company per se; however, I am in charge of myself and my destiny. Loyal, encouraging, unconventional, risk taker, atypical, who sails against the winds… Thrilled at being me and taking on life’s adventures. 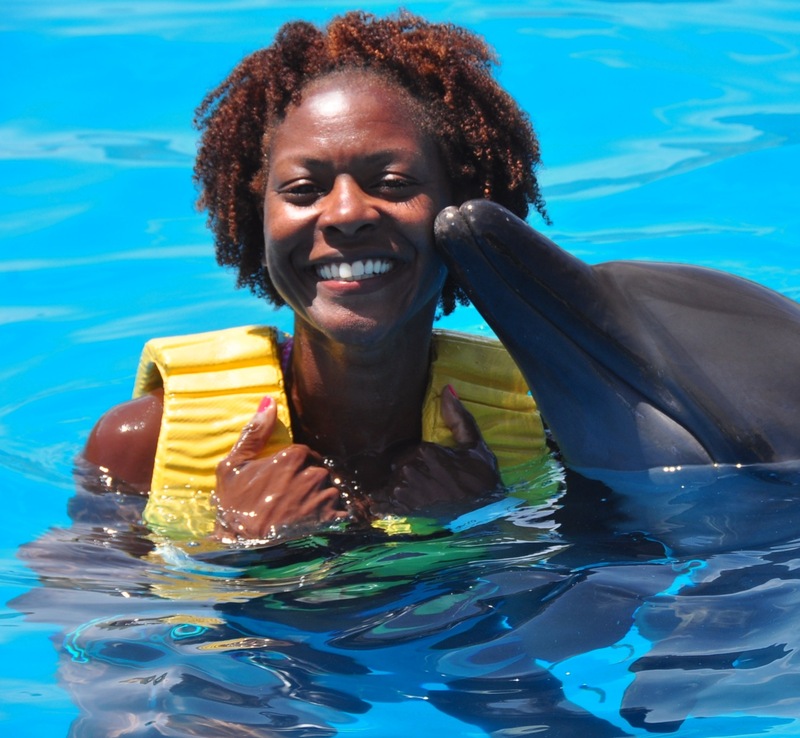 Here I am being kissed by a dolphin in Mexico (2010) on a family vacation. This was the BEST experience ever! Yes, I was TERRIFIED! I am an extrovert. I have to talk about my feelings and get things off of my chest… blogging is a constructive way to do this. Writing also helps me to reflect, sort through, and seek meaning in some of the madness in the world. To share my experiences with others. It helps to know that others face my challenges and likewise. I share what I learn with others and hope that others reciprocate. I’m a fitness and wellness fanatic and believe that my body is my temple. Fitness and proper nutrition are essential to my life. I write with the goal of sharing my knowledge and helping outhers to live healthier lifestyles. Lexa is dedicated to my father, Axel who died my senior year of high school. I think of him often, and I know that his spirit is with me. I know that he is pleased with my progress. My pleasure! I’m always seeking information to improve my fitness knowledge base and I like what I’ve read at Marpay Fitness. Thank you! It’s a New Year! Let’s raise the bar! You’re truly inspiring. I adore the part about your father, may his soul rest in peace. Keep doing you and juggling it all and sharing your journey with us all. I’ll be tuning in. Thank you Omonaij! It is so nice of you to stop by! Of course I look forward to your Sunday posts and leaning much from you! Lexa, It is because of your inspiring conversation with me that I have finally begun my long awaited journey! Aundre, Congrats on starting your “long awaited journey!” I’m excited for you. Please update me on your progress. Meanwhile, if there is anything that I can do to help you, contact me. 🙂 Thanks for stopping by Lexa’s Journal. Hi Hillary! First of all, thank you for stopping by and for your kind words. The energy comes from within and is from a good place. I’d like to believe that positive energy is contagious—I’m putting it out there and hope is spreads like the flu! 😘 keep in touch.